It was hard to roam the Statehouse last week without encountering hospital lobbyists and insurance executives huddled together in the hallways. The subject of at least some of their scrums: how to appease increasingly impatient senators seeking to level the playing field between independent doctors and large medical institutions. "We're trying to preserve independent practices in Vermont, and part of the reason they're hurting so badly is the wide disparity in reimbursement rates," said Sen. Michael Sirotkin (D-Chittenden), referring to the price tags for medical procedures. The problem, as he sees it, is a Byzantine billing system that results in commercial insurers paying independent doctors dramatically less than their hospital-employed peers. Legislators have been pushing to close that pay gap for nearly four years, but progress, in the words of Senate Finance Committee chair Ann Cummings (D-Washington), has been "slower than molasses in February." In 2015, the legislature ordered Vermont's two commercial insurers — Blue Cross Blue Shield of Vermont and MVP Health Care — to come up with a more equitable billing method. It asked the Green Mountain Care Board, which regulates Vermont's health care system, to oversee the process. Two years later, not much has changed. Summoned to the Senate Finance Committee on April 20 to explain the delay, GMCB executive director Susan Barrett told the panel, "It's not a simple task." Cummings responded with exasperation. "We know it's complicated," she said. "We know you've got a lot to do. But we're losing the independent practices, and once they're gone, they're gone. It's like an endangered species." Her committee is trying yet again. Sirotkin hopes to pass legislation during the final days of the session that would require stakeholders to come up with a plan to reduce payment disparities. But it faces pushback. "We feel like we haven't made much progress, so we have to be more directive," Sirotkin said. "More and more independent practices are either closing up or being sold." That's been the case in Vermont and around the country for years. In 2013, 37 percent of providers nationwide were independent — down from 57 percent in 2000, according to a study by the consulting firm Accenture. No one seems to know how many independent doctors remain in Vermont. Amy Cooper, executive director of HealthFirst, which advocates on behalf of the state's physician-owned practices, estimates there are roughly 300. HealthFirst represents 140 of them, she said, but the organization lost 20 members during the last year and a half as doctors either sold their practices or shuttered them. "It's been feeling like a hemorrhaging of independent physicians," said Cooper, who largely blames "extreme differentials in payment rates." In her view, this disparity is the product of unequal bargaining power. "Independent practices basically have to take the prices [from insurers]," she said. "Hospitals, on the other hand, have a lot of leverage." Insurers pay the University of Vermont Medical Center an average of 220 percent more for the same primary care services and 275 percent more for specialty services, according to Cooper. Her figures are based on reports from patients because insurers won't disclose their rates. She gave an example: An independent dermatologist gets $109 for a skin biopsy, compared to $349 for a skin doc affiliated with UVM Medical Center. Hospitals don't accept Cooper's numbers. Concerned about cherry-picked examples, they've urged the GMCB to conduct its own review. 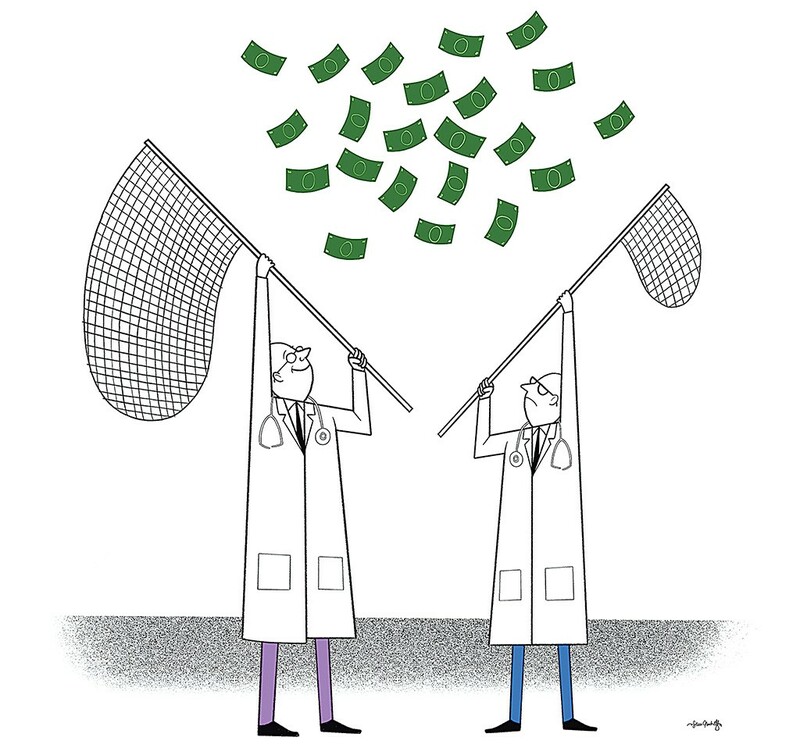 But the quirks of the current pricing system are hard to ignore when a hospital acquires an independent practice and reimbursement rates immediately skyrocket. For patients, that can mean higher out-of-pocket expenses and, eventually, higher premiums. According to the GMCB, hospitals absorbed 12 independent practices from 2015 through the end of 2016. Both Blue Cross and MVP, each of which has their own billing policies, say they're prepared to stop reimbursing hospital-affiliated practices at a higher rate — in the future. The Senate Finance Committee's legislation requires this change. But boosting pay for independent doctors to match that of hospitals is a much greater challenge, in part because lawmakers want insurers to do so without increasing patients' premiums. "If you just increase [reimbursements to] everyone, that increases medical costs," Kelly Lange, director of health care reform for Blue Cross, told lawmakers. If the insurer can't charge higher premiums, Lange continued, hospitals would have to accept lower payments. The issue came up last Thursday at a GMCB meeting at the board's headquarters, just up the street from the Statehouse. "We would have to dramatically increase reimbursements in other places," Dr. John Brumsted, the UVM Medical Center CEO, told the board. He argued that his institution relies on higher reimbursement rates to subsidize its academic program, trauma center and all the specialized services it provides. "If you don't do that internal cost shifting ... you end up not being able to fund the academic medical center," he said. Regulators are approaching the subject with caution. Robin Lunge, who serves on the GMCB, said she wants to address this billing issue "without undermining payment and delivery system reform." For years, Vermont has been considering a far greater overhaul of its health care system: adoption of an all-payer health care model, in which providers would be compensated based on patients' health outcomes, not the number of procedures performed. Some health care players question the need to address the billing disparity when the state is considering doing away with the existing fee-for-service model entirely. "I will disagree strongly that the way to do that is through a simplistic approach that is taking a small piece of the system ... and bring[ing] equity to that and not look[ing] at the total system," Brumsted told the board. Hamilton Davis, a former lawmaker and a journalist who writes about health care policy, said the senators' efforts are "marginal to the whole [health care reform] debate." He suggests their time would be better spent preparing for all-payer. Senate President Pro Tempore Tim Ashe (D/P-Chittenden), who has sided with the independent docs for years, argues that there's no guarantee the state will in fact transition to an all-payer model, which requires federal cooperation. "Why tolerate such inequity in the meantime?" asked Ashe, who preceded Cummings as Senate Finance chair. "For reasons I can't understand ... regulators and policy leaders have avoided getting some first downs because they're always going for a touchdown on the first play of the game." Ashe's analogy assumes everyone is aiming for the same goal line. But lurking in the background of this debate is a more existential question about whether independent doctors are a species worth saving. At one point during the Senate Finance meeting two weeks ago, Sirotkin asked Michael Del Trecco, vice president of finance for the Vermont Association of Hospitals and Health Systems, "Does the hospital association support the continued existence of independent practices?" Del Trecco responded haltingly, suggesting ambivalence: "We haven't taken a firm position on that, but we wouldn't say no to that. Of course not." Davis is unabashed about his position. "Ashe is selling this idea that you're gonna kill independent doctors and that independent doctors are critical to the system," he said. Davis contends that a single coordinated system can provide better, cheaper care than "atomized" independent practices. According to Brumsted, UVM Medical Center is already able to do that. Although the hospital charges more for certain services, Brumsted claims that its total cost of care per patient is actually among the lowest in the state because the large institution operates more efficiently. The CEO objects to any suggestion that the medical center may be squeezing out smaller practices. "I really take it personally when people blame the academic medical center ... for the inhospitable environment for independent physicians," he told the GMCB. "There's nothing in what we do that is trying to drive those folks out of business." Barrett, the GMCB executive director, told lawmakers that it's hard to parse the impact of the dwindling number of independent practices. "Consolidation can lead to greater efficiencies, but it can also lead to higher prices," she said. Cooper makes the case that independent doctors, in addition to providing competition, "offer a different kind of medical practice that's more flexible, more innovative and more responsive to patients' needs." Dr. Hannah Rabin runs a family practice in Richmond in a brick house that she and her two partners renovated themselves. "We get to make our own decisions," Rabin told lawmakers. "We're trying new things. We're agile and kind of nimble because we're small." For instance, she said, they'll call patients with chronic conditions who've failed to make follow-up appointments, and they've started meeting with patients for longer blocks of time. The disadvantage? "It's really hard to recruit new physicians to join us because we make less money," Rabin noted. It's not clear whether lawmakers will have any more success with their latest attempt to change payment practices. Senators say they're committed to continuing to try. "We can't afford to lose any more of them," Cummings said. "We're trying to find a lifeline to throw out there." Disclosures: Tim Ashe is the domestic partner of Seven Days publisher and coeditor Paula Routly. Hamilton Davis is the husband of Seven Days assistant editor Candace Page. Find our conflict-of-interest policy here: sevendaysvt.com/disclosure.